Product prices and availability are accurate as of 2019-03-18 18:46:37 EDT and are subject to change. Any price and availability information displayed on http://www.amazon.com/ at the time of purchase will apply to the purchase of this product. Waterfront kitchen faucets offer single-handle temperature and volume control with clean design lines for a distinctly contemporary appearance. Waterfront's ceramic disc cartridge delivers leak-free operation, even in harsh hard water environments. The exterior housing, constructed of a metal-infused polymer, is durable and extremely resistant to corrosion, scratching and discoloration. 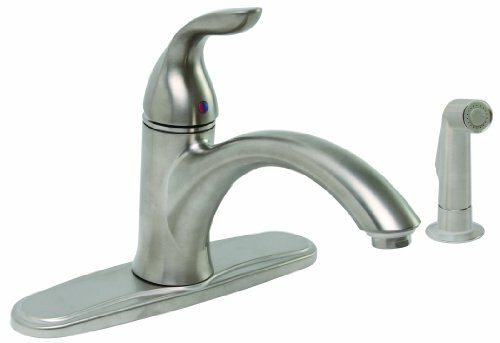 For easy installation, this Waterfront faucet includes pre-installed 18-inch stainless steel braided supply lines. Waterfront kitchen faucets meet the strict lead-free standards of the Safe Drinking Water Act. This model is featured in an elegant brushed nickel finish and has the matching spray included.